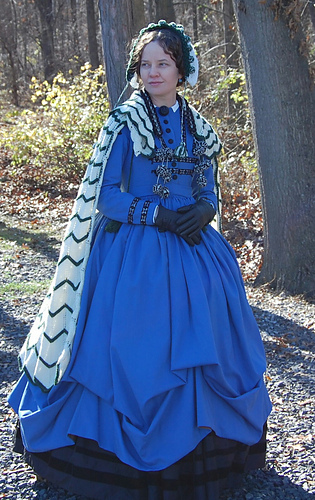 23 November--I wore the talma this weekend! It was quite cozy and fun to wear. 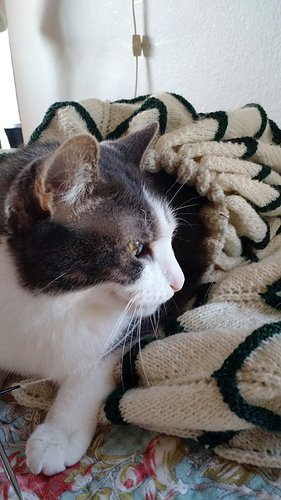 Unfortunately, the collar is turned up in the pictures. Oops. 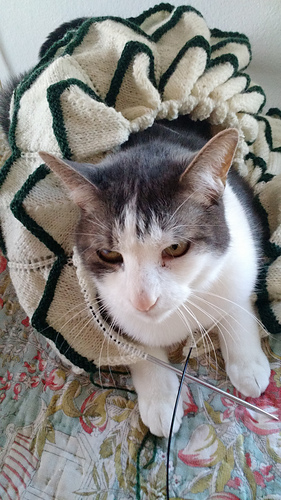 I also need to block the edging a little better. I don’t really have much to add to the notes. It is a little narrow at the shoulders, but I have two CDVs of cloaks just as narrow on Pinterest. I wouldn’t widen the hem if I made it again, which I’m not going to, but rather narrow more steeply at the top. I like it not gathered at the neckline. The body and collar have the same amount of stitches at the top, so it really is how long the cloak was narrow that made it so narrow. But, it shows off my dress more! The engraving didn’t match the pattern, so I did do a bit of my own thing. 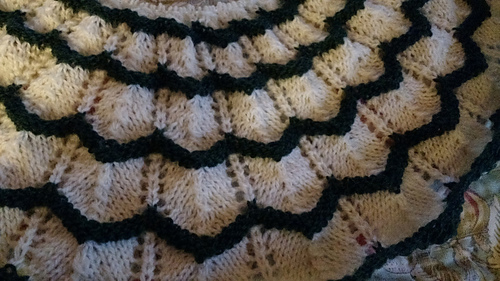 I liked the contrast stripes, so did them on all 14 repeats. I only decreased two rows every other repeat, because every repeat would make it run out of stitches. Decreasing two rows every repeat would get rid of 28 rows. That’s also why I started with 14 stitches between the decreases and YOs. If you only had 11 stitches, you’d run out. 28 August--This is very close to done and has been for a while. It just needs a border and ties. I’ve decided to do a border in points, like one in a CDV. 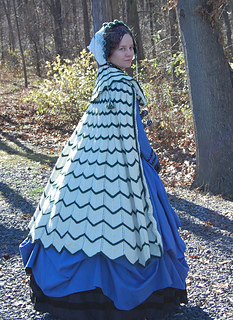 The cloak turned out a little narrow over the shoulders, just like the one in the CDV. 6 January 2015--So, I decided I needed to make this giant thing. 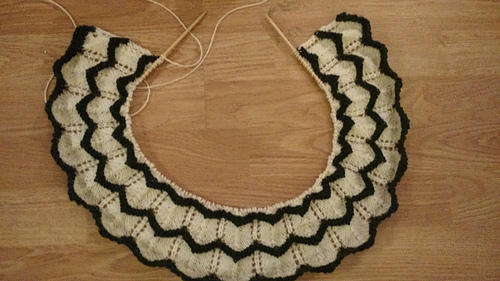 I started with the now completed collar to sort of test it out. I’m glad, as I discovered a few quirks. I want to pretty much rewrite the body. I’d like the same number of points as in the collar, and I think I need it narrower. Also, there are 11 stitches in the part of the repeat where you decrease, and you decrease 14 times. It doesn’t quite work! Also, each repeat is 2 rows shorter than the last. Only, the first repeat is 22 rows long, and you do 14 points, so that doesn’t work either. Oops. 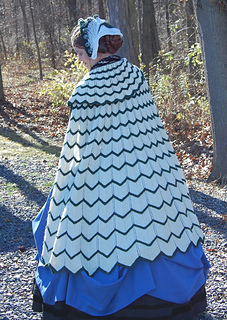 The collar didn’t have a full set of repeats, so I’ll probably repeat this in the cloak. The last point needed 4 more stitches to be even, so one point is slightly smaller than the others. I didn’t figure out exactly what was happening until I was much further in than I’d consider fixing it. 28 January--I’ve started the body, and have made most of the changes above. I decided the shortened point would be too obvious in the larger size, so did it correctly. This means I cast on 579 stitches. There are 18 points, just like the collar. 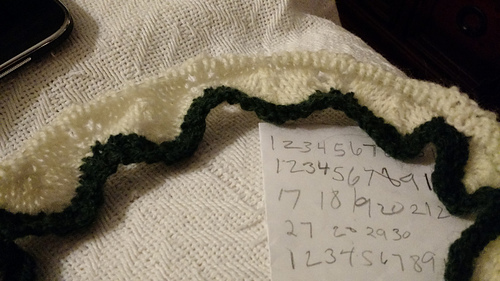 This worked out with 14 stitches instead of 11 between the decreases on the first repeat, and allows it to be 14 points deep the way the pattern suggested. 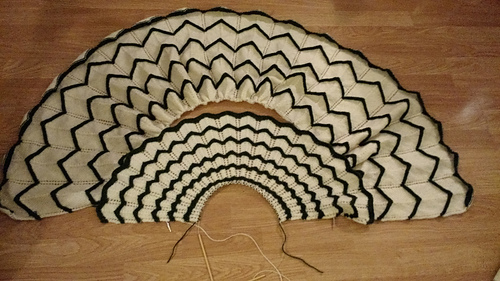 The first two repeats are 22 rows between the green, then the next two will be 20, and so on. 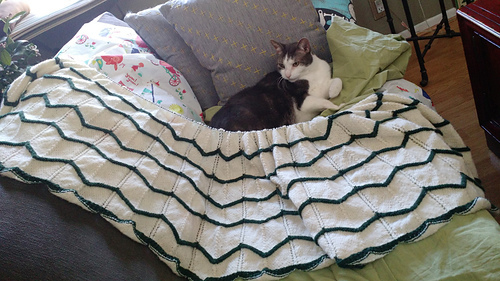 The first green row I knit instead of purl so the color change would be on the back. As of writing this, I’m three rows away from finishing the 22 rows of the second repeat. Hopefully I decrease to 507 stitches tonight!